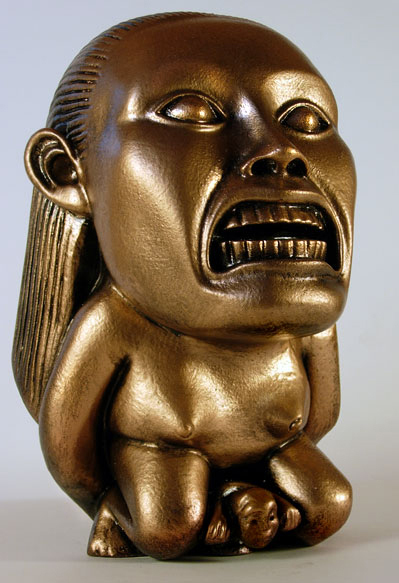 Indiana Jones' Gold Idol - Our Fertility Idol, more commonly referred to as the Golden Idol, is the first artifact that appears in the opening sequence of the 1981 film Raiders of the Lost Ark, directed by Steven Spielberg. The Idol is the first relic that the audience sees the Indy acquire, establishing him as not just a treasure hunter, but a daredevil of the highest order. The idol's likeness has become iconic in popular culture and now it can be yours. Full size prop replica cast in reinforced polyurethane Resin with a shipping weight of about 4 pounds. Makes a great addition to any prop collection or a fine display piece for your home theater. Our replica comes with a COA ready for framing. The Idol is the first relic that the audience sees the Indy acquire, establishing him as not just a treasure hunter, but a daredevil of the highest order. The idol's likeness has become iconic in popular culture and its appearance is not limited to Raiders of the Lost Ark. In addition to Raiders, the Idol is also seen onscreen in the episode "Dax" of Star Trek: Deep Space Nine (season 1, episode 8), in Jadzia Dax's quarters, in the treasure room in the film Spy Kids 2: The Island of Lost Dreams, as part of the collection of Dryden Vos in the 2018 movie Solo: A Star Wars Story, in the web-based puzzle game Star Wars: Galactic Spy, and on display in a museum in the third level of the 1998 video game Blood II: The Chosen. Makes a great addition to any prop collection, a fine display piece for your home theater, or if your day job is on a star ship it looks great in your quarters! Our replica comes with a full size certificate of authenticity ready for framing.